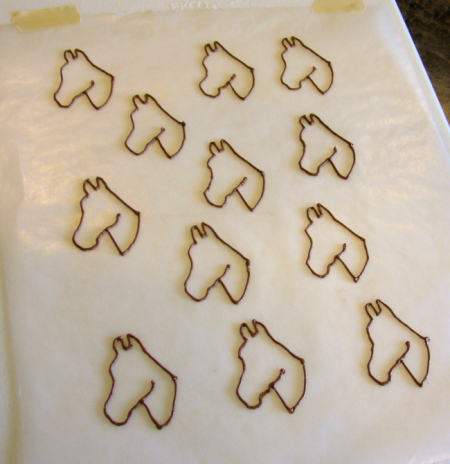 I consistently receive emails about how to create cake decorations out of royal icing. 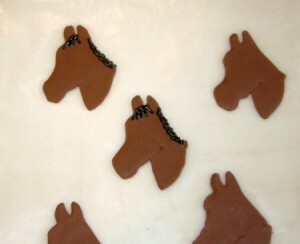 These fun decorations make great cupcake toppers as well as centerpieces on cakes. Are they time consuming? Sometimes. Are they awesome? Heck yeah! 🙂 But first of all…are they easy? They sure are…once you know the basics! Get your image. You need to find the image you want to recreate. I’ve done various things over the years from guitars to large custom logos (for that one I found a Harley logo and changed the letters). Google is your friend! 🙂 For these horses, I googled horse head and then clicked on Images to do an image search. Once you find what you want to replicate, resize it if needed and print it out once or multiple times if needed. For these horses I put 1 dozen on a page. Prep your work area. Take your image and tape it onto a large cutting board or sheet pan. Then take wax paper and put it over the top and tape it down nice and flat (don’t let it bubble up at all). You can see pics of how I did this below. Load up your bags – and go! We’re going to start with the outline of the horses head. So for this project I loaded up my piping bag with a Tip 2 and my stiff, brown icing. 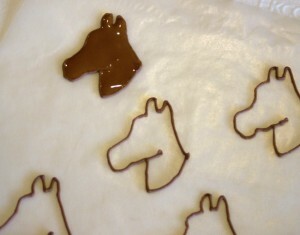 We’re going to start by piping to trace the border of the horse’s head. Once you have them all traced, let them sit for a couple minutes to let the border dry out. If you have a bunch to trace, the first ones will probably be “set” by the time you finish outlining. Here you can also see how I prepped my work surface. All done tracing! 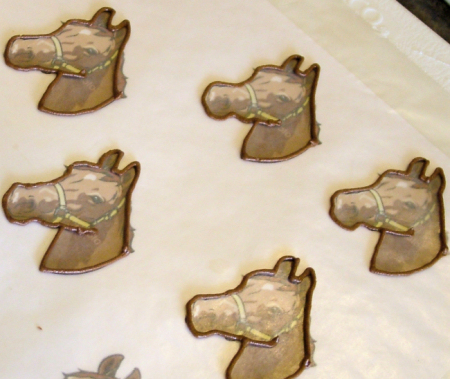 Now we’re going to thin out our brown icing to flood fill them in. 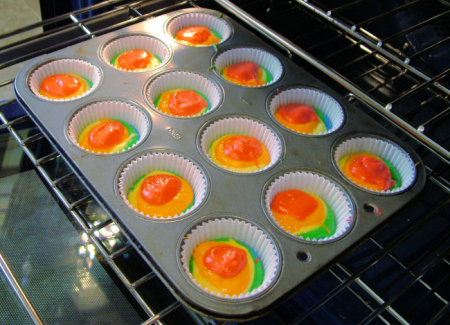 Basically we are going to add water – little by little – to our stiff icing to make it runnier. 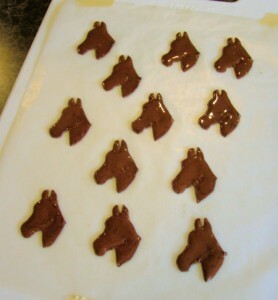 Then we will be able to fill in the horse heads and have them be one solid, smooth surface. Now its time to get ready to flood fill. 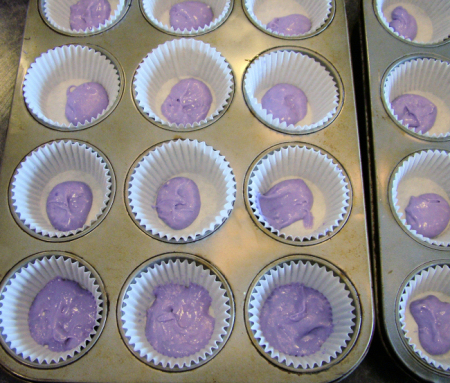 Fill a new piping bag with a Tip 3 with the thin royal icing in the color you are filling in with. For me it is the thin brown. To flood fill, we are going to start at the edges and pipe a border of sorts inside our thick icing. 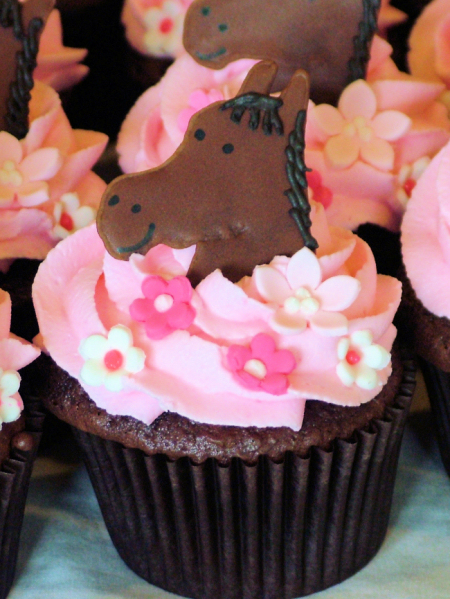 Have a tooth pick handy to push the icing into small spaces (like the ears in the case of my horse). 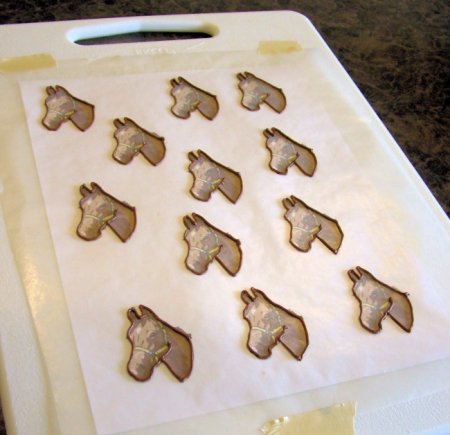 Once you have the outline done, add more icing to the middle – but don’t add too much! 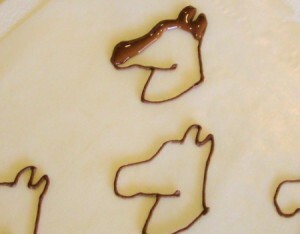 You can kind of push the icing around with your icing tip to move it into place. You don’t want to add so much that it overflows your border you made. Drying time! Now you have to sit back and wait…for a day! 🙂 You want these horses to be good and dry before you add any other decoration to them. So set them aside and let them dry out for 24 hrs at least. Decorating time! So after your images have been sitting for a day, its time to decorate. For my horses, I accented them with a black main using royal icing and then eyes, nose and mouth using my black food writing marker. For the mane I loaded my stiff/thick black royal icing into a piping bag with a tip 2 and piped on the mane. And then I finished by using my food marker to draw on eyes, nose and mouth. Alternatively you can pipe these on. Its really up to you what floats your boat 🙂 Different options give different looks and take different amounts of skill and time. After the piped decorations are dried well (give it a few hrs at least), they are ready to remove from the waxed paper. Remove the tape holding the wax paper down. 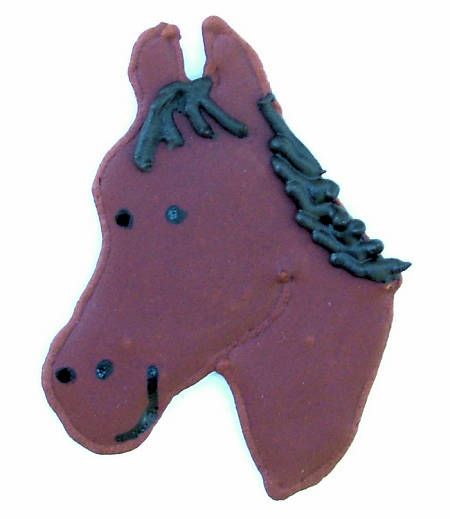 You can then put your hand under the first horse head and support it as you pull the wax paper down/away. It should start to separate from the paper. 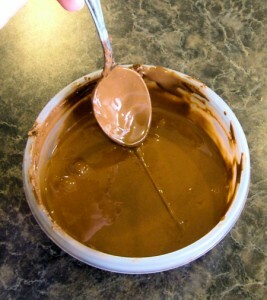 You can then use an icing spatula to slide under it to loosen it the rest of the way. Be careful! These are fragile. I always make a few extra just in case. 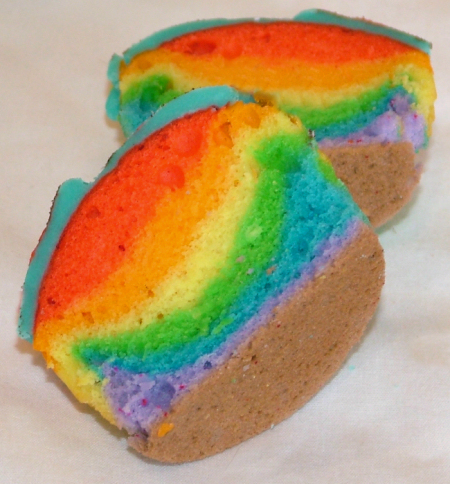 Cakes come in so many flavors, but what about colors? Coloring cake batter is an easy way to add some extra fun and surprise to your cake. And kids love it! 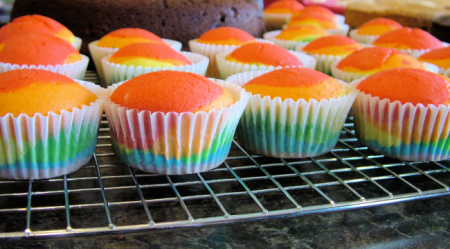 Today we’re tackling how to make rainbow cupcakes. I made these last week for my daughter’s 9th birthday. You can start out by making your favorite cake recipe (whether it be a mix or scratch) for WHITE cake. Be sure to use egg whites as specified on the back of the box and NOT whole eggs. The yolk gives a yellow tint and it will be harder to get nice, true colors. 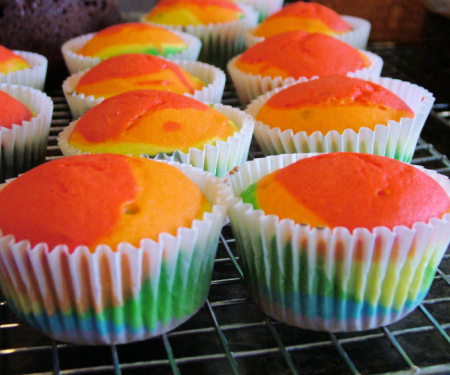 If you are baking from scratch, be sure your recipe makes enough batter for the number of cupcakes you need. My measurements are based off of making 24 cupcakes. After you have your batter mixed up, split up the batter evenly into 6 different dishes. I got somewhere close to 3/4 cup worth of batter into each color. But mixes do vary some. Now we’re going to start filling our prepared cupcake liners. Starting with purple, put about 1 tsp of cake batter into each liner. I then kind of spread the purple out to cover the whole bottom nicely. You can see below, the bottom row I spread out but the other rows I hadn’t yet. Then follow up with the next color (blue). 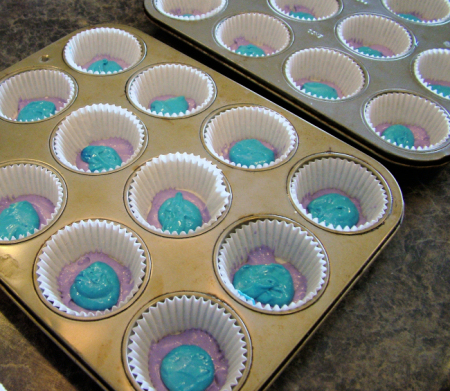 Add 1 tsp of blue on top of each purple layer. Note I did NOT spread the blue out like I did the purple. If you do too much spreading it will start to blend the colors. I just kept putting one color on top of the other. As I would dump each one in I would try to get it “spread” out as I dumped. But I didn’t go back and spread it to the sides. 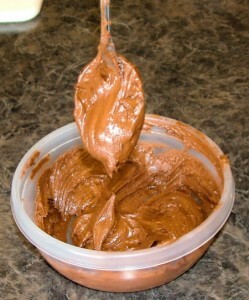 As they cooked, the batter spread out on its own…you can see that end result above.